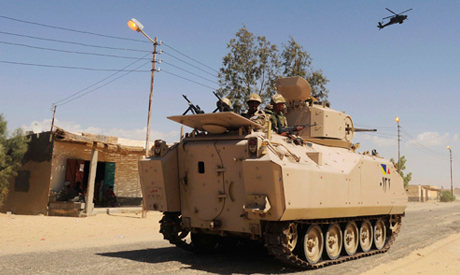 Three Egyptian soliders were killed on Tuesday in the Sinai peninsula, Reuters' Aswat Masriya has reported. A conscript was shot dead by unidentified assailants in the city of Al-Arish in North Sinai. The attackers were riding a car when they shot the conscript near Al-Arish's central security headquarters. Earlier during the day, two soldiers were killed when a roadside bomb struck their armoured vehicle near Al-Kharouba in North Sinai. Security sources told Reuters that the attack took place when suspected militants remotely detonated a bomb as security forces were patrolling the area. Six other soldiers were also wounded in the explosion, the sources added. The northern part of the Sinai peninsula, adjoining Israel and the Palestinian Gaza strip, has long been a haven of Islamist insurgency. But militant violence, mainly based in the mountainous region, has increased since the 2013 ouster of Islamist president Mohamed Morsi. Attacks and bombs by militants have killed hundreds over the past 18 months, mainly security forces in North Sinai, though smaller-scale bombings and shootings have become commonplace in the capital and other parts of the country. This is not how a responsible state would deal with this matter. Why not talk with these people? what do they want? What are their demands? I have been talking to some of these so-called terrorists, and I have found their cause perfectly legitimate. They want human rights and civil liberties, they want freedom of speech and expression, they want to be able to form political parties reflecting their convictions, they want the government to leave religion alone. They want the military not to intefere with politics, they want a transparent justice system and a real separation of powers. Frankly,they are 100% correct. I know it is politically incorrect to say this, but the Sissi regime has no right to control religion (Islam, but not Christianity) whereas religious people have no right to speak politics. The Sissi regime is not truly secular. It is fascist, pure and simple. Truly secular governments don't interfere with religion. In the US, government has control over religion. To over come those terrorists hiding behind civilians, go block-by-block and flush it out of arms. Shoot to kill. And 95% of Egyptian troops are religious, they believe in Islam.